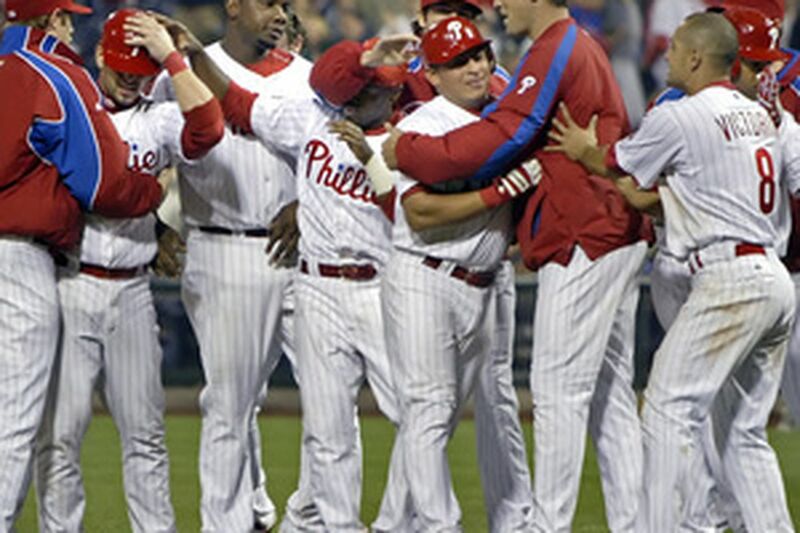 Teammates mob Carlos Ruiz (center) after his bases-loaded single wins it for Phils in ninth inning. HOMERS SET the tone. Small ball won the game. In the eighth inning, Jimmy Rollins hit his ninth homer of the month and Chase Utley added his fifth to take the lead, but the Phillies needed more. They got it, scratching out a run in the ninth to take a 6-5 win from the Marlins last night. They loaded the bases with a walk from speedster Michael Bourn, the fourth hit of the night from Aaron Rowand and a lovely bunt from Wes Helms before Carlos Ruiz chopped a bases-loaded single up the middle off Randy Messenger, scoring Bourn from third base. It is their first one-run win of the season. They have won six of seven and seven of nine after starting 3-10. "It's a big win," said Rowand, who is in the midst of a 15-game hitting streak. Last night, he got his fifth homer to lead off the second, but he lauded Bourn, a rookie who pinch-ran for Pat Burrell in the seventh then remained in the game for his defense. "That at-bat from Bourny was huge," Rowand said, "against a guy with a real good curveball and throws 96." Bourn, hitting .214, turned a 1-2 count into a 3-2 walk. "I was just thinking, 'Battle.' That's it," said Bourn, who spent most of 2006 at Double A Reading, but made the Phillies with a good spring. "Sometimes I get two strikes and start pressing. I said to myself, 'I should still make this pitcher make a mistake.' "
Tom Gordon (1-1) made a couple. He blew his third save in seven chances this season in the top of the ninth. "I've just got to find a rhythm," Gordon said. It again raised the question of his role vs. that of new reliever Brett Myers, who dealt a scoreless sixth and seventh inning. Ryan Madson's clean eighth preceded Gordon's ninth, in which Mike Jacobs collected a fourth hit, tying his career high with a leadoff double. Eric Reed pinch-ran and scored on Cody Ross' one-out double, but Gordon escaped further damage. Gordon has blown seven of 24 save opportunities since July 4, but manager Charlie Manuel remains steadfast: Gordon's the closer; Myers, at best, is his apprentice. "Brett will get some chances to close," Manuel said. "I think Flash made two pitches that hurt him. His fastball was good. Once they scored, he bore down and gave us a chance to win the game. I think it's just a matter of time. His stuff's there." True: Gordon's limiting the damage framed the finish to a fine night by Ruiz. Ruiz entered 3-for-19 with runners in scoring position and went 3-for-4, including an RBI double in the Phils' three-run second off starter Anibal Sanchez. He threw out two runners trying to steal second base, of which he was especially proud. "I'll take the two runners thrown out and the win over a couple of base hits," Ruiz said. The Phils needed all of it. The Phillies have won six of seven and seven of nine to move to 10-12. What happened in the ninth might not have been enough without the eighth. Rollins and Utley homered off lefty Taylor Tankersley and took starter Freddy Garcia off the hook in a game in which he struggled. A month into the season, the advertised Garcia has yet to make an appearance. Manuel expects Garcia to build his velocity to 95 mph as the weather warms and he builds back strength in his right arm after a preseason bout with biceps tendinitis that cost him his first two starts. That expectation seemed a long way away in last night. Dealing at around 90 mph, Garcia - the trade prize that made the Phillies boast they were now the best team in the National League East - needed 106 pitches to make it 4 2/3 innings in his third start of the year. He struck out eight, but gave up four runs on seven hits and two walks. Garcia surrendered solo homers in the first, to Miguel Cabrera, and in the third, to Jacobs. But Garcia flirted with danger all night. It bit him in the fifth, when he left the bases loaded and Antonio Alfonseca allowed two inherited runners to score. Amid it all, Rowand continued his torrid hitting. Rowand is 26-for-58 with five homers and 10 RBI during the streak. "He has good balance at the plate. His bat's quick," Manuel said. "His hands are real good right now." Surprisingly, Helms, a lumbering power hitter, has real good hands when he bunts. He has nine sacrifice bunts in his eight seasons but went 6-for-6 in sacrifice attempts last year with the Marlins. Messenger would have had to be perfect in fielding Helms' bunt toward shortstop. Helms made it to first, credited with a sacrifice, safe on a fielding error. He had told Ruiz in the dugout that he was bunting all the way. "Even if I didn't get the sign," Helms said. "We needed to win that game." That's what everything is about now. Of course, they need to win tonight and tomorrow against the Marlins and Monday in Atlanta to have a winning April. "A win like this can start a roll," Rowand said.